Tap into south of the border taste with Cod and Shrimp battered with Corona®! Real beer flavor in every bite turns appetizers, baskets, platters, sandwiches and entrées into a seafood paradise. Corona (TM) Beer Battered Natural Cut Cod fillets offer real beer flavor in every bite! 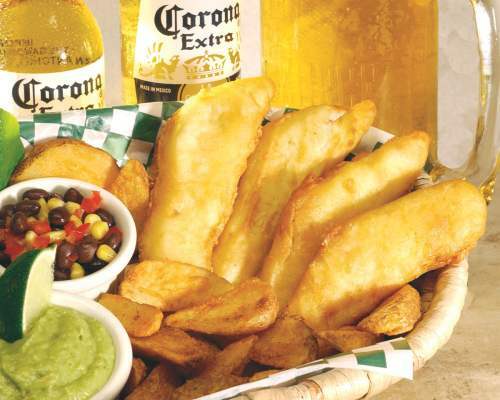 Our beer battered cod has superior holding power and gives you Corona (TM) Beer brand recognition. DEEP FRYING: TO DEEP FRY: Preheat fryer to 350°F and fry for 61/2-71/2 minutes. NOTE: COOK TO AN INTERNAL TEMPERATURE OF 165°F MINIMUM.